Koh San Keum graduated bachelors and masters from Ewha Women’s University and Pratt Institute of Fine Arts respectively. She was among critics’ selected 55 Korea’s contemporary artists in 2007. Instead of using traditional medium of canvas and paint, Koh uses white or black wooden panels onto which she attaches pearl beads or steel balls. Selecting texts from a novel, song or newspaper, Koh replaces the words with pearl bead or a steel ball. A word is transposed into a pearl bead or steel ball, a space with a space and a new type of text is created and its original function of language fades while it establishes itself as a new text made of language of sensation and multimeaning. 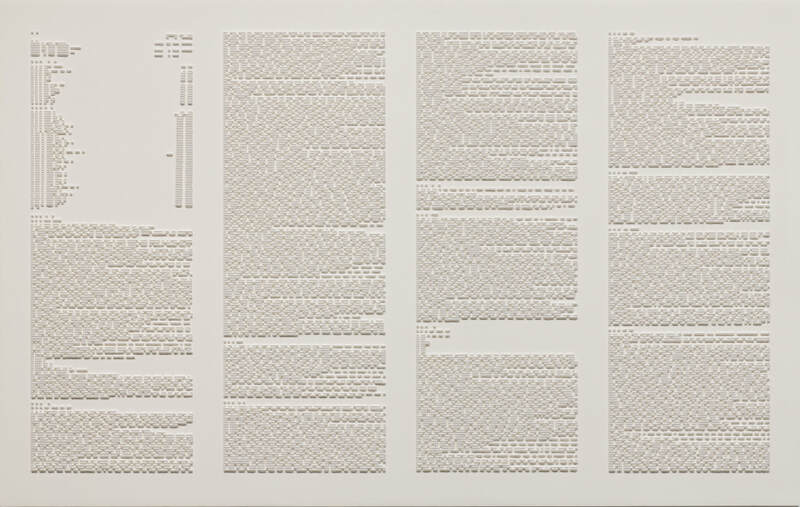 In other words, her text made of beads or balls is a transformation of a text of meaning to a text of form of which its visuality matters much more. The transposed “language” of form and visuality is open to individual interpretation and meaning. Moreover, Koh selects a text whether it’s a news article or a page from a novel which its event or status has already been proved to be significant or influential that it becomes a metaphor symbolizing cultural and social trends engaging the viewer more effectively in advance to their own personal interpretation.